Osamodas – The Sadistic Creator of Shushus (Demons), Animals, and the Elements1. Thirteen of the Fifteen Disciples pay homage to a god or goddess, and the Osamodas’s Whips are one of them. 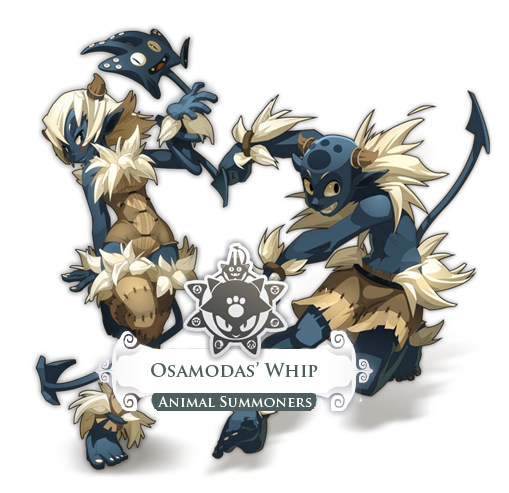 Though they should more accurately be called Whips, people call them by their master’s name: Osamodas. However, calling them by their master’s name does not do the god any justice. After all, Osamodas is the most powerful god of all the major deities. No other deity comes close to the power that he has. His powerful aura only allows eleven entities to come near him, those being the other eleven gods. Furthermore, his raw power alone can defeat anyone in his path. Add in the the fact that he has the three most powerful dragons (Ouronigride the Black, Helioboros the White, and Spiritia the Colorful) always at his side, who spawned the three black dragons, three white dragons, and the six elemental dragons who became the founders of all the other dragons of the World of Twelve, and no one dares threaten him for fear of being pulverized. With the exception of Enutrof, who himself is a dragon, every other dragon one sees is under the control of Osamodas. Along with Osamodas creating the animals of the world, his dragons gave birth to the World of Twelve, the four elements (Water, Fire, Earth, and Air), and Black Magic (Stasis) and White Magic (Wakfu). Since Osamodas created the world in which the other deities helped further complete, that would mean the he is a benevolent god, right? Nothing could be further from the truth. Osamodas should not be called a god but rather a Demon with his grotesque horns and claws. He loves to use his whips on his enemies for the fun of it, and even reminds others constantly that his clothing, and that of his disciples, are made out of the genuine skins of his enemies. You heard that right! The disciples skins are made out of human and other humanoid skin, and not that of animals like that of the other gods and disciples. So why did he engender animals you ask? He is a taciturn Demon, or rather one that is usually silent. He does not wish to associate himself with any other being. Thus, he created animals to keep himself company since he relates best with them. When he does want company, he tends to want to companionship of the other Gods of Black Magic such as Xelor with his time that creates decay, Sram with his devious actions, Enutrof with his greed, and Sadida with his voodoo magic and carnivorous plants. Hence, why they were the first to come when the World of Twelve was born. Everyone can see the wickedness in his eyes. He would not flinch when it comes to killing another deity’s disciple if the disciple harmed or killed one of his creatures. Yet, there are even more heinous ways. After all, it is believed the Osamodas created the shushus, or demons. Yes, the fearsome Rushu most likely was a creation of Osamodas. This further shows how powerful Osamodas is. If he could create such a monster that can rival the gods, how powerful is he actually? They are thought to have been a former project of his. However, whenever asked by others whether he created them or not, he remains silent on the matter. Luckily, for the gods, the shushus are unable to cross into the Universe, with a capital ‘U’. Yet, Osamodas is a Demon, so how could he cross into the Universe? As mentioned before, Osamodas has dragons of both Black Magic and White Magic. Hence, despite him preferring Black Magic, Osamodas is able to harness both types of Magic. There is much more to tell about Osamodas…..but that is for another time. It is time you are introduced to the disciples of this polarizing Demon/God. Hello, this is Ash Ketchum and I desire to share my advice on how to make an Earth Osamodas (or Osa for short). Despite its bugs, such as Critical Hit % and Block not transferring to the Gobgob, the build is a delight to play due to the various spells you can use. Since it is a jack-of-all-trades build, the Earth Osa functions similar to that of a flanker in rugby in that it does not necessarily have as many assigned duties compared to others and must have an all around good balance of stats. This also makes the Earth Osa one of the hardest positions for other teammates to understand since many group members think with a specific mindset that Player A is a DPS, Player B is a tank, and Player C is a healer. An Earth Osa is all three. Hence, to get the most out of the Earth Osa, both the players and teammates have to understand how it is played. Thus, it requires a lot of thinking to use. You will sometimes even run out of time during certain situations since there are a lot of options you can take So if being a jack-of-all-trades that requires a lot of tactics appeals to you then you should probably continue reading. Also, another benefit for Earth Osas is that all Earth Spells are worth leveling. But with the current spell experience, you will want to focus on 2 or 3 spells. However, what I said prior does make you have something to look forward to as the level cap rises. Also, like every other class, you start out with 6 Action Points (AP), which can only be used for spells, and 3 Movement Points (MP), which are used for either moving your character or spells if a spell requires them, that you can use every turn. They will be replenished every turn, unless someone or something places a debuff on you that decreases the amount you can use per turn. Furthermore, you have 6 Wakfu Points (WP). These cannot be replenished each turn, and once you use them they are gone for that match. You only replenish them after the battle. If I had to pick a traditional class that the Earth Osa most parallels I would have to choose the Paladin. In many MMORPGs, the Paladin is a slow moving close combat tank with mostly melee and short ranged attacks, while also being able to heal and buff allies. They also need to have a good balance of stats. Like the Paladin, the Earth Osa lacks mobility due to two of its most used spells costing Movement Points (MP) to cast, as well as lacking anyway to escape or teleport. Also, Earth Osa spells lack range, though they can be modified with range. Nonetheless, spells have ranges of 3, with one having having 4 but unmodifiable, which becomes more restrictive due to needing MP to use them. Thus, since you will want good resistance, you will be functioning in close combat and will be needed to take hits for your fragile members. Finally, as mentioned earlier, you will be a healer and buffer with this class, and will need a good balance of stats. Hence, one could easily see how this build resembles the Paladin, though of course you will need the assistance of your Gobgob, a major difference between an Earth Osa and Paladin, which I will now mention. The Gobgob will be your loyal and trustful companion throughout your adventures as an Earth Osamodas, and it will be the only summon that you can have out if you choose to go this route. So I sometimes refer to it as my Pikachu. Despite this being the only summon you can have out, it has a lot of diversity, and more than what a Fire Osamodas can have with his capturable pets, as well as it is controllable. It has one attack costing 3 AP (so it can be used twice) that deals 25 Damage per use at level 100+ or heals 17 when used on an ally. It gets its other spells by the Osamodas placing spells on it, which it will have a total of 5 extra spells. The level of the Gobgob’s spells will rely on the spell levels of the Osa, besides its main attack (Black Hole) which will depend on the Osa’s character level but will not go past 100. These spells that are transferred are given charges to the Gobgob, which the Gobgob can use for that turn. It cannot save these charges for later. When a Gobgob uses one of the spells it will deplete a charge. For example, to allow the Gobgob to use Starry Armor twice you will have to use Armored Command on it twice. Being able to use 6 spells from Gobgob and 5 spells from the Osamodas causes the gaming style to never become mundane. However, unlike other summons, when the Gobgob gets attacked he will transfer the damage to you. Luckily, it is reduced my 50% final resistance, but this can be harmful if you are both attacked in an Area of Effect. So make sure you do not get into these sort of situations. Furthermore, the Gobgob has the same amount of health as you. So it basically is linked to you. Fortunately, the Gobgob does not loss its health when it takes damage, but only transfer to you. The only time it suffers damage is if there are affects such as Motion Sickness on the Gobgob, or if damage is reflected to it. So the Gobgob can be a very nifty summon as a tank. Unfortunately, it cannot lock. But it is very good against players and monsters that have linear spells. So though it cannot lock, it can be a tank in certain situations. Nor does summon damage from gear transfer to the Gobgob, but spells do increase its damage. To make it easier to know what stats get transfer to the Gobgob I will list them for you. The list of stats that transfer: Critical Hit, Block, Health, Dodge, Resistance, and Damage (once Animal Link is leveled, which I will get to later). As stated previous, the Gobgob has an attack. This spell is called Black Hole. Along with it dealing 25 Damage or 17 Heals for 3 AP, it can be used on itself to unsummon itself. This is very useful to use if for some reason the Gobgob is too far away or if it is in a situation that you want it to get out of. I will tell you about the other five spells in the Spells section. So far that is all I have to say about the Gobgob mechanics. If you need anymore information on the Gobgob, just post here on or message me through AnkaBox, and I will post further information here. Since this class can heal, something must be said about heal resistance. Every time you someone, or yourself, the player will gain heal resistance, which will decrease the efficiency of heals. Currently heal resistance is the percent of max health the person got healed divided by eight. Luckily, healing is only half of the buffs you put on people. So it will not be such a major issue for you. Also, Earth Osas can help prevent heal resistance build up buy placing buffs such as Starry Armor on players since it provides a shield so that players will not get hurt as much. Now that the information on the Gobgob is complete, I will now tell you about the two end game builds that you will have to choose from, with each having positives and negatives. I want to tell you that the guide is sometimes broken down into 9 AP and 10 AP setups since both are viable, but different in some aspects. As of the Frigost update, I personally prefer the 10 AP due to its flexibility in combos. It is not all too hard to get gear that give 10 or so spell levels now with the addition of the Hagen Daz set for end game. So you can pretty much level all your spells evenly if you want and have all spells in the high 80s with gear. Plus, with the level cap now at level 120 and 125 in June, it becomes easier to invest in multiple spells. To get back to the point, part of the time when you are 10 AP you feel that your 1 more AP is useless when you use Armored Command three times. So 9 AP is viable is you want to focus on mainly using Armored Command. But it is up to you for whatever you choose. Do you prefer the 9 AP build with superior damage% and thus better overall healing/shield, or do you go for the 10 AP build that has more flexibility. Remember, both have their positives and negatives. Also, do not feel like you need to follow my information. My information is here simply to guide you. I encourage new ideas if you have your own thoughts. As I have stated previously, I find that all spells will be worth leveling once the level cap rises. In this section I will look at each of these spells and tell you the pros and cons, which classes these spells should be cast on, and their offensive and supportive ranks. Even if a spell is ranked 4th in support it does not mean it is useless. It just means that 3 other spells are overall better for support. Also, remember these are just my opinions. All spell descriptions will be using maxed level statistics. 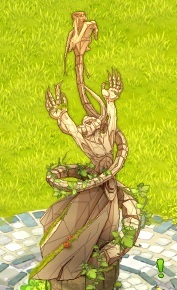 Summary: This is the best supportive spell in the whole earth branch. To counter that, it does have bad offensive power, so never use this as an attack spell unless you do not have any MP. However, to get the most out of this spell you will have to put it on a person that will get attacked. Hence, you need to understand the AI of the enemy or the thinking of the opponent and the thinking of the ally that you are applying it to. Do not apply this to an ally you know will not get attacked. This is one reason why you should have high resistance since you know that you will not be attacked if both you and an ally is in reach of an enemy. It is a must spell for both 9 AP and 10 AP builds. Classes: You will more often than not want to place this spell on a close combat ally since they will more than likely get hit during the turn. Cras tend to run away, so this should not be used on Cras as much unless you know the AI will attack the Cra that turn due to various reasons such as their low resistance since AI prefer to attack players with low resistance. Use this spell mostly on Iops, Sacs, Earth Enus, Fecas,Srams, Air Rogues, and Masqueraiders. This spell is more used for its offensive power for a 9 AP build than anything else. It is the best offensive spell in my opinion for this build. As for 10 AP, it is not a necessity unless you want maximum flexiblity like me who levels all spells evenly. Support wise it is nothing truly special, being the second lowest in my opinion, since the damage it does is really bad for how much you invest in it and the spell range is bad as well. Add in the fact that Gobgobs cannot lock, as well as it does not heal allies, and you are looking at a very situational spell to use. That is not to say that it is useless. It is far from useless. I especially like using this to set up the Gobgob Spell Rain of Stars, which you get from Weakening Command, to maximum efficiency. Plus, it is good to help allies escape, which is most effective when the ally’s turn is near and after yours since it will allow them a higher chance of not being in a tackle zone when their turn begins, and the spell also can help with monsters that have linear spells. So I do use this spell frequently, but since the other spells overall are generally better I will mark this as the second lowest when it comes to support. Classes: As I stated previously this is a situational support spell, but it does help classes that do not have a dodge move, such as other Osas and Earth Enus. So use this on allies you know will not be able to escape when they need to escape. This spell gives an ally +2 AP no matter the level, so leveling it only increases the heal. With the update, the heal is rather good now since it is practically 38 heal for 3 AP once the 2 AP buff is canceled out with the cost of the spell. Previously, I stated it should be something like 35, so 38 is more than good. But anyhow, this spell is good for if you want to be safe since, unlike Armored Command in which you do not know if they will benefit from the shield, you know that they will always benefit from the +2 AP buff. However, remember this spell can only be used once per ally per turn. The offensive usage of it is not bad either if you need a single target attack. Classes: Use this primarily on allies that stay behind, such as Cras. That way they heal and get added firepower. This can also be used on any ally, but you must understand your ally’s build to make sure they get a lot out of the 2 AP buff. You need to think before using this. As of the update, this spell has completely changed. It no longer gives resistance. It is a straight heal now, and a mediocre heal at that. I see no use in casting the spell on your gobgob since there are many more options to use than this. You could use this if you want to play safe though. As for damage, this is the second best damage spell overall. Yes, the next spell, Weakening Command, is AoE, but that also creates problems sometimes. Thus, I rank this higher. Classes: Use this on any member that needs saving and you think Armored Command or Motivating Command is not an option. This is arguably the best AoE in the game. It can deal 65 base damage for 5 AP, and thus is usable twice every turn if you have 10 AP. Weakening Command was one of the reasons why I was an Earth Osa before the revamp. The support spell is also nifty as well, especially when you can get 6 + allies or enemies in its AoE, which is not at all hard to do, especially when you use the Gobgob’s teleportation spell to position the Gobgob correctly. Classes: This can be used on anyone, but best used when targeting the most allies and enemies. You must think of how to best place the Gobgob to take advantage of the support spell though. Since in this game spells level only when you use them, and you have a roof to how much spell experience you can gain, you will need to level them according to how strong you want them. As stated previously, you want to focus on a set amount of spells, but you also want to level the other spells of the same element to increase the earth damage % of your character since you gain a damage and resistance bonus as you level them. Also, spells do not increase these bonuses by the same amount. I will have to look up the percent though, but if you want to get the maximum amount of damage you can get you have to level all your spells. Also, level the other spell branches somewhat to get resistance in these elements. I would typically make the other elements about 30-35% of my current level. For specialties, I will break it down into two parts: active and passive. I have done this for many reasons. As you can notice by the names, these specialties are different due to some needing to be used to function, while the others increase the power of your abilities. Furthermore, the evolution of each is different. Actives can only be increased to level 9, while passives can be increased to level 20. Furthermore, while it only costs 5 points (one level) to increase one level in a passive throughout its leveling process, actives gradually need more points as you increase its level. For levels 1-3, it will only cost 5 points per level. For levels 4-6, it will cost 10 points per level. And for level 7-9, it will cost 15 points per level. Hence, it will cost you 90 points, or 18 levels, to increase an active from level 0-9, while it will cost you 100 points, or 20 levels, to increase a passive from 0-20. Active specialties are on the top row, while passive specialties are on the bottom row. I will now begin with active specialties. Just like spells, the statistics are for max level. What it does: Summons your Gobgob, and increases the number of slots for capturable monsters. In my opinion, this should be the third specialty you should level, after Animal Link and Animal Guard. The only advantage to leveling this is that the cost of summoning the Gobgob decreases and the range increases. The number of slots is irrelevant to the Earth Osa since that only affects Fire Osas. However, the increase in range from past 3 is rather insignificant since all spells of your’s, besides Weakening Command, have 2 less range than this at maxed level. Also, you will not be unsummoning and resummoning your Gobgob all that much early on, so keep this unleveled until after the two aforementioned specialties are leveled. Once you start leveling this you can chose between level 7, 8, or 9, depending on your preference since it costs a WP no matter which level you chose. It will just cost 3 AP, 2 AP, or 1 AP to cast. I would recommend level 9 since you will have certain times were you will want to unsummon and recast it. But overall, the evolution of leveling the spell seems lackluster. Wish there was more to the evolution of the specialty. What it does: Summons a Capturable Monster, and increases the efficiency of the Capturable Monsters. This is not worth leveling for an Earth Osa since it neither benefits the Gobgob or the Osa. You could possibly want to level this if you sometimes want to be a summoner, but it is not recommended. Again, this is another specialty that will not benefit you since your Gobgob is already controllable. This is the least likely specialty to level. What it Does: Increase the Critical Hits and Block of Gobgob, or of yourself if you are in Dragon form, by 20 each. You will either want to level this to 9 or not level it at all. I do not see this being worth leveling if it is not maxed since anything more than 1 WP for the buff is not worth it. This overall is a rather decent specialty but you will not want to level this until after Animal Link, Animal Guard, and Gobgob. Unfortunately, many times I do not use this. But many specialties for the Gobgob lack a wow factor currently, as you will find out. But it is useful at times. So level this in my opinion. What it Does: Allows you to morph with your Gobgob to become a dragon, and gain added stats. This will typically be the fifth or sixth specialty you will level, depending on whether or not you get Prespic Hair. It will give you an additional + 1 AP, +1 MP, +1 Range, +50 % Damage, and + 20% Resistance when you morph. Beware, once you use this you can never transform back. The reason to level this is simple. Earth Osa currently only has 5 specialties that are directly linked to it, with Prespic Hair being rather useless. By pairing this with Phoenix Spirit you can use this as a last resort if you are about to die so as to be resurrected with 20% Max HP. Hence, it does have use though it will cost you 39 levels to be effective, and it will hardly be used. But like I said earlier, many Gobgob specialties are lackluster. I leveled this as my fifth specialty since Gobgob currently does not fully utilize Prespic Hair since many players and AI refuse to attack it. This is another specialty that is rather useless. It does give you 40% Critical Damage in Dragon form, but overall you will want to save this until you max out seven other specialties before ever committing to this one. Hopefully by then Gobgob will have more specialties. As I have been saying earlier, this will be leveled second after Animal Link. It gives you a 40% chance to allow your Gobgob to gain 5 MP, 40% Damage, and 80% Resistance every time you are attacked when maxed, but it cannot be stacked. This is very useful, especially in PvP where you are almost guaranteed this bonus. You gain the bonus whether you or your Gobgob is attacked. This is a MUST spell. In the horde of luckluster specialties for an Earth Osa, this is extremely lackluster. It reflects 20% of the damage when targeting the Gobgob. Unfortunately, most people and AI do not attack the Gobgob. This specialty is most useful if you are in a PvP match with an Air Sac who can hurt the Gobgob with Motion Sickness, but even then you do not need it to defeat them. You can use this if you prefer not to use Dragon as a last resort. Also, it is currently broken at the moment. This is the very first specialty you should level up. It transfers your earth damage % into a water damage % for your Gobgob. Even general damage transfers as water damage % so that general damage affects heals. Without this leveled first your Gobgob will be useless. So you must level this first. Whenever you level Symbiosa, you will want to level this directly after you max Symbiosa. If you skip over Prespic Hair you should have this and the six other specialties all maxed once level cap is raised to 115. This will give you a 100% chance to be resurrected in Dragon form with 20% max HP. Unfortunately, this is bugged since in PvP you do not gain 20% of your max PvP health. But that should be fixed with the next update. The bug does not affect PvM though. In this section, I will show you four different ways you can distribute your specialty points. Each of these have their positives, and negatives. So you will have to chose what is best for you. As previously stated in the past, there are less options to chose from since level cap is rising. Eventually everyone will have to put points into dragon since there are only five gobgob specialties. The 9 AP and 10 AP setup generally will have the same stats except that the 10 AP will need to invest in an MP. Thus, you will see a lot of similarities between the two builds when I talk about them. Feel free to skip over the build you do not want to do if you are already committed to one since it will feel repetitive. 1-31: Save up for an AP point. Despite only being 9 AP, you will want to save up for one since your best set (not including Magmog as a viable set) will give you an MP set bonus rather than a AP set bonus. If you are lucky, and do have an Magmog set, you will want to get an MP instead. You will save yourself 50 points by having Magmog. After getting an AP, the 9 AP build can go a variety of ways. You can put all your points into Strength after getting your AP, which is what I did. This provides for maximum damage. You may also invest in a Range since your spells will have low range and at times I wish I invested in a range, particularly when I am facing Air Sacs since if the Gobgob gets out of range while the Sac is in my tackle zone it almost always is 1 square away. So range could be worth it for certain situations, but many times I do not find the need for it. I would rather have more damage, and use offensive spells when Gobgob is not in range rather than trying to be support all the time. But again that is my opinion. Some of you will prefer the added range. You may also invest in Block which makes you more tanky, but like range it makes your power weaker. Also, if you build your 9 AP build properly, you will already have high resistance, so block often is not optimal. MP point is also viable since your spells do use MP. Critical Hit at the moment is not viable since Gobgob currently is bugged. It is up to you what role you want. Do you want pure damage or more flexibility? You may even want to put points into Health Points. It all comes down to personal preference. Do not feel obligated to do anything I say. As already stated earlier, a 10 AP build will have to invest in both an AP and MP. After getting an AP, the 10 AP build will also have many different ways to go with the remaining points. However, it will have fewer points to invest in these additional stats. So that is one major difference. You can put all your points into Strength after getting your AP and MP, which is what I did. This provides for maximum damage and support. You may also invest in a Range since your spells will have low range, but most of the time you will not need the added range since Gobgob should be fairly close to you at all times. But it all depends on how you play. Some people will find the added range useful to them. Other options include Health Points and Block if you want to be more of a tank. But, if you build your 10 AP build properly, you will already have high resistance, though not as much resistance as the 9 AP build. Another MP point is also viable since your spells do use MP. As previously stated, Critical Hit at the moment is not viable since Gobgob currently is bugged. It is up to you what role you want. You should make your own decisions. This would be a good site for looking at gear: Wakfu Elements. I prefer to use this site over the Encyclopedia since it is much more user friendly to look through. Plus, it has some extras to it such as a Set Builder and Marketplace to help in your gear searching. This section will start out as a guide for both an eventual 9 AP and 10 AP Build before branching off into separate directions. I will link the gear to the Wakfu Element website so you can look at the items and their stats. Remember, you do not have to follow my information. Always feel free to do what you want. Level 3: You will want to wear a Wodent Set during this stage of your adventure. This is a really easy set to get from Wodents in Incarnum, which you should be fighting anyways. Or you can get the Dark Wodent Set from doing the tutorial, which gives the same stats. Also, if you can try to get Makabrards, though often called Makacards or Maka cards, as soon as possible. The link might show them as level 100, but they are cards that level as you level and they start at level 0. You can buy them from the Boutique on the game website or buy them in-game from another player. But do not worry, these are not pay-2-win items since these are not as strong as other items at level 100. Level 7: At level 7, you should be able to wear the Adventure Set. If you do not currently have a Adventure Set once you hit level 7, do not worry. After all, I recommend that you kill Bow Meows around this level, which drop this set. Also, keep the Wodent Breastplate. Level 8: You will want to wear Twiggy Daggers as your off-hand. They will give some Earth Damage and a little bit of Wisdom for faster leveling. Level 14: At level 14, you can wear the Gobball Epaulettes. You should get the Gobball Epaulettes by that time since you will be killing Gobballs starting at level 11, which you can find them by looking at my Character Leveling Guide below. Level 15: By this time, you should be able to wear the Gobball Set. This will be your first set that gives an AP bonus. If you do not have the full Gobball Set by now, which you probably do not if you are new since you need two people to have a chance to get the Gobball Headgear, you will want to start mining to mint kamas, which is the money of Wakfu. You will need to start mining anyways since the rest of the gear later on will need to be bought with kamas since it will be hard to get just by dropping. You will wear an additional Bouze Lite Yeah’s Ring with the set. With this set you can do a Speedy Command + Weakening Command combo. Level 22: You will know want want to replace your extra Bouze Lite Yeah’s Ring with a Kapow Ring. Level 25: You can now replace your Twiggy Daggers with The Bumper. Level 35: At Level 35, you will be able to wear your next AP set: Royal Gobball Set. It may seem like a huge wait between 15 and 35, but there is no AP set between these two sets for you. With this set, you can wear another ring and a belt as fillers. I would recommend another Kapow Ring for the ring and a Crabbelt for the belt. Beware, there are two Crabbelts. Make sure you get the level 25 version and not the level level 67 version. Level 45: Swap out The Bumper for a very nice Treechnid Dagger. Level 47: You will now want to change your two Kapow Rings to Crackly Rings. Level 55: Now it is time for your next set, the Tree Set. This set will give you an AP bonus, like the previous sets, and will give you decent Earth Damage and General Resistance. At this level, you can also now swap out The Bumper for the Spite Dagger if you have been unable to get a Treechnid Dagger. But beware, the Spite Dagger has variations, so try and get a perfect version. You could start fighting Treechnids right now, or soon, to try and get the Treechnid Dagger. Level 65: You can now chose to swap out your Treechnid Dagger or Spite Dagger for a Petra-Pack if you wish to be a little more defensive rather than offensive. Level 68: At this level, you can wear two AP sets at the same time: the Infernal Set and the Divine Tofu Set. Also, wear an extra Divine Tofu Ring with the set. This setup will give you a good amount of Earth Damage, General Resistance, Health Points, and a large amount of Wisdom (69). This is a very good setup for leveling. Plus, you will have 9 AP. This is very good if you are a 9 AP Build since you can do the combos you want now. Level 71: If you already have a level 100 Makabrards or Legendary craft weapon in waiting, you can now wear the Noble Crab Stick. This will allow you to have 10 AP. Level 73: You can now swap out your off-hand for Backagens. You might want to get this even if you have the Noble Crab Stick since they might be useful to you later, depending on how you build. Level 87: You can now wear the Tauxik Hammer instead of the Noble Crab Stick if you so desire if you are going this route. This now completes the guide for both 9 AP and 10 AP builds. I will now go on to write about the two builds separately. Level 97: For those wearing a Tauxik Hammer only, you can now wear the the Radioactive Set. You will also want to swap out your Infernal Cape with a Moowolf Finery, your remaining Divine Tofu Ring for a Moowolf Signet Ring, your Divine Tofu Belt for an Imperial Puddly Belt, your Infernal Breastplate for a Breastfut, and your Divine Tofu Epaulettes for Boowish Epaulettes. Level 100: For those that had to keep leveling their Makabrards, you can now wear the aforementioned gear once your Makabrards have reached level 100. For those that were using a Tauxik Hammer, you can now wear your level 100 Makabrards now or the Legendary craft weapon you have chose, probably Tijeebon Mallet or Zeorus’s Blade, along with your Backagens that I told you not to discard. If you do not have a Legendary craft weapon, I would recommend working towards getting one. It will take a lot of time though so I do not expect everyone to get one. Level 101: It is now time to swap out your Boowish Epaulettes for Rampart Epaulettes. Level 105: You can now swap out your Backagens for two options: either the Khiel’s Aegis if you want to be more defensive or The Bloodthirsty if you want to be more offensive. However, The Bloodthirsty is expensive so you might want to stay with the Backagens for a while if you want to be more offensive. However, I would recommend Khiel’s Aegis no matter what to get a better balance of stats since you want to have good resistance remember. Level 106: You will want to swap out your Imperial Puddly Belt for a Rampart Belt now. Level 110: For the lucky people with Magmog Set, you can wear that with Radioactive Clasp, Radioactive Ring, Radioactive Amulet, Breastfut, and Rampart Belt. Also, if you are even luckier, try and get a Rogmourne. Remember if you have Magmog Set to reset your stats since you will need an MP rather than AP. Level 93: You can now wear a Moowolf Set. Also, swap out your Infernal Breastplate for a Breastfut, your Infernal Boots for Radioactive Boots, Divine Tofu Belt for Imperial Puddly Belt, and Divine Tofu Epaulettes for Boowish Epaulettes. Level 94: You will now swap out your remaining Divine Tofu Ring for a Radioactive Ring. Level 100: It will now be the time where your Makabrards will be level 100, or swap to your level 100 Makabrards or Legendary weapon craft if you already have them. You will use Backagens as your off-hand if you were using the Backagens. Now will be the time to work towards getting a Legendary weapon craft if you do not have one already. Level 101: You will swap out your Boowish Epaulettes for Rampart Epaulettes. Level 103: Now change your Radioactive Boots to Rampart Boots. Level 106: Now will be the time to replace the Moowolf Finery with Rampart Cloak, Imperial Puddly Belt with Rampart Belt, and Moowolf Bell with Rampart Amulet to complete your Rampart Set. Level 110: For the lucky people with Magmog Set, you can wear that with Radioactive Clasp, Radioactive Ring, Radioactive Amulet, Breastfut, and Rampart Belt. Also, if you are even luckier, try and get a Rogmourne. Since this build was created well after I was a high level, this section will be hard but I will do the best I can. I will add links to the monsters later on by having links to the Encyclopedia since I find it better than Wakfu Elements to look at monsters, just as I find Wakfu Elements better for equipment. One good notion about Earth Osas is that they are extremely good at soloing. They can take on mobs of monsters alone that most classes will easily die if you play smart . Level 1-7: The first creatures you will want to fight are the Wodents in Incarnum. Wodents is the first creatures you will ever see since they are in the tutorial area. Reason: They are the weakest monster in the game, and they also will drop the Wodent Set. Level 7-11: You will want to start fighting Bow Meows in Astrub, which is the starter zone after Incarnum. They can be found directly outside the town with the family of Piwis. Reason: These drop the Adventurer Set that you will be wearing for a while, and they are also very easy to kill. They will attack and try to run away so you will not take very much damage from them, despite them having 4 MP when you have 3 MP. They are very easily to kill in mobs with Weakening Command. Level 11-20: Now, by this time, you will want to choose a nation and go to the nation you chose to fight Gobballs Sufokians can find them in Tydal Prairie, Bontarians can find them in Monty’s Prairie, Amaknians can find them in Hugo’s Meadow, and Brakmarians can find them in Mr. M’s Land. The places are located to areas adjacent to the nation village, which really are not villages. Still wonder why they are called villages when they are barren of housing. Reason: These monsters hit with earth. Hence, you will have some resistance to their attacks. They will not be hard to kill, though they will be higher difficulty than the previous monsters. You will want to start to learn how to use the Gobgob to block your enemy’s/enemies’ path. Learning this skill will be necessary from now on. Also, keep the Gobball keys for later. Level 20-25: You will either want to continue fighting with Gobballs or start fight Plants, which can be found in the Fertile Prairie in the nation of Amakna. If you are not in Amakna already, you will want to either learn how to make Canoon Power, or start mining to get money to travel there. You will also want to click on Zaaps to use them later so that you will only have to pay 2 kamas to use it rather than having to constantly pay 5 kamas for the boat that can take you there. Reason: Though the Plants have earth resistance, your earth resistance will be superior to theirs, especially if you stat Strength. Other mobs around this level will have around 10% to everything. So 20% resistance to your attacks is nothing since you have resistance as well. You will also drop Kapow rings from them, which will be used as part of your equipment later on. 25-35: If you have not already starting leveling on Plants, I would really recommend that you start fighting them since experience from Gobballs will not be near as good as from Plants. Reason: Just look at my previous reason from the prior level range. 35-50: Now you will want to go to the area just north of the Fertile Praire called Singing Fields. In this area you will want to fight Scarecrows and Puddlies. Reason: Despite them not being earth based, these creatures hit low and have low HP. They are extremely easy to taken on in high level groups, despite their level. Just remember not to take on groups more than twice your level for maximum experience. Reason: The dungeon should do no significant damage to you due to your earth resistance, and will give you very good experience.Plus, the Royal Wool that drops from the boss will be very useful to keep later on for a Legendary craft weapon, or to sell for kamas. If you are not doing the dungeons, the Wild Gobballs are very easy and quick fights with the proper group particularly since they will attack with earth mostly. 60-70: You will want to continue soloing Royal Gobball Dungeon, or start fighting Treechnids, which can be found in Emelka in Amakna and Yuburt in Bonta. You can also start fighting Boowolves or Wereboowolves in Sadida Kingdom in a group with other players. Reason: Treechnids are another easy Earth family. They are the same resistance as plants, so resistance to your attacks will not be a problem. You will want to take on mobs of 2 or 3 of them. Boowolves in groups will provide a new experience for you since this is where it will get tougher to fight creatures, particularly if the Priestess summons a moon. 70-90: You will want to continue with Treechnids, or solo Wild Gobbals mobs now instead of needing groups. Also, continue on fighting Boowolves when in a group or you can head over to Monk Island for some new mobs to fight. Reason: I particularly recommend that you should start doing group play, rather than solo by now, if you have not done groups already since group play is very important later on. Plus, you will want to learn how to work in groups since you have to remember that Earth Osas take a lot of thinking to master. 90-105: When you solo you should continue fighting Wild Gobballs, but if you have a group you can start fighting monsters on Whispering Island, which should add a new learning experience for you. You can also play in a group at Sadida Kingdom as well if you want. Reason: It is very important that you start Whispering Island since these new monsters have gimmicks that add to the tactics of the game. So it will not be simple tactics of constantly hitting your opponents. This will further prepare you for Frigost (Chillberg), which comes out soon since these monsters are supposed to have even more tactics. 105-120: Level 105 is around the level you can start taking on the high level monsters of Frigost with effectiveness. Reason: The Frigost monsters drop valuable gear now, give good experience as of May update, and there are also easy environmental quests to do as well. Gobgob currently does not get either Critical Hits or Block from the Osa. Currently the only way for the gobgob to perform a Critical Hit is by using Critical Synergy. Gobgob currently does not receive PvP health. Gobgob should receive PvP health do to it being linked to the character, and the player would be useless without it. Dragon currently does not get resurrected with PvP health. Gobgob should receive damage when it uses black hole on an enemy that reflects it rather than unsummon it. This gets rather frustrating against crows and makes gobgob useless with these enemies.